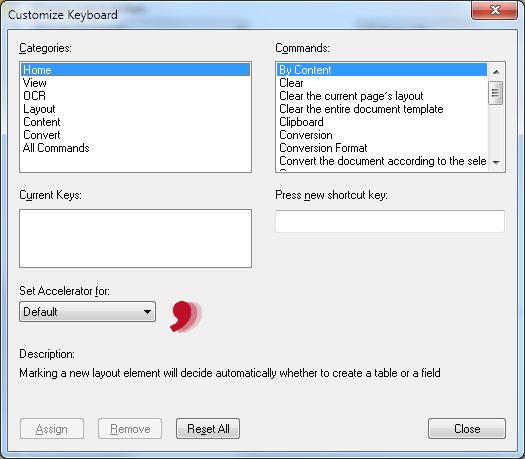 The Customize Keyboard dialog allows you to completely customize PDF2XL CLI's keyboard shortcuts. You can add, change, or remove keyboard shortcuts for any existing command. First of all, find the command you want to change. You can pick any of the specific categories in the Categories list to make the search shorter, or select All Commands to view them all in one big list. After you've found the command you need in the Commands list, select it. Once you've selected a command, the dialog will display relevant information about it: its current keyboard shortcuts will be listed under Current Keys, and many commands will also display a description at the bottom left part of the dialog. After finding and selecting the command you want to add a keyboard shortcut for, click on the textbox under "Press new shortcut key", and press the key or key combination that you want to assign. The combination you pressed will be displayed in that textbox, and under the textbox you can see whether there's any other command which currently uses that shortcut. If no other command uses it, it will say "Assigned to: [Unassigned]". Adding a shortcut which is currently assigned to another command will make it stop working for that command. If you want to change your selection, pressing any other key combination will display that in the textbox in place of the old one. Alternatively, pressing Esc will clear the textbox. Once you've entered your desired keyboard shortcut and verified that it's indeed the shortcut you want to use, simply press the Assign button. The key combination will move from the textbox on the right to the Current Keys list on the left, and you will be able to close the dialog and start using it. After selecting the command you want to remove the shortcut from, you will see the list of shortcuts in the list under Current Keys (some commands may have more than one shortcut). You can now simply select the shortcut you want to remove, and press the Remove button. The shortcut will be removed and you can freely assign it to another command if you want. Pressing the Reset All button will reset all the keyboard shortcuts to their default state, reassigning shortcuts that you've removed and removing shortcuts you've added. This action is not reversible.